Andre Alforque: Facebook as a Messaging Platform? I tried to send a message to a friend on Facebook. 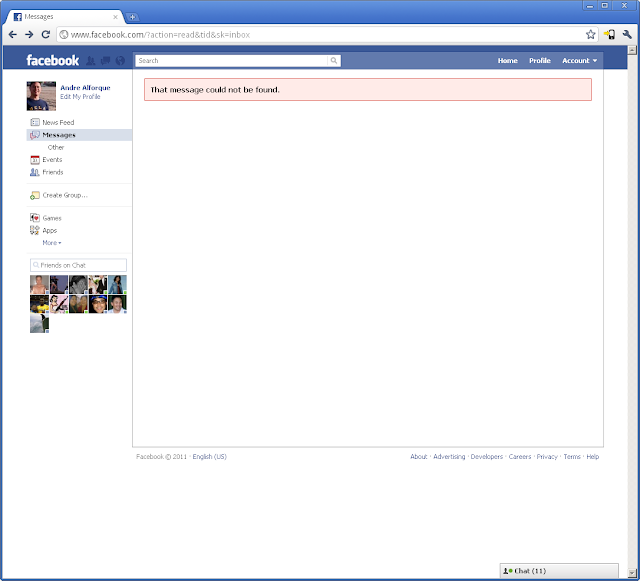 I hit the "Send" button and receive the message below from Facebook, "That message could not be found." After spending some time to craft my message (a recommendation for a friend), you can understand my frustration that the message was now gone. No auto save. "Browser back" did not retrieve the typed message, only an empty message box. Very disappointing. I have the same error today. Do you still have this problem? I got this too. So annoying. it still sends the message when I get this error, so don't send 100 times!